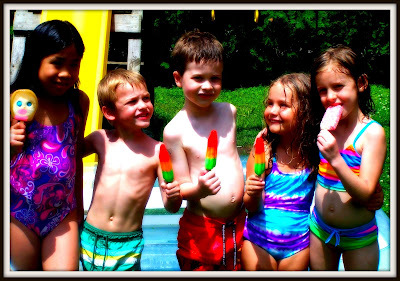 I'll tell you what equals ultimate fun to the Sabourin kids on the very first Saturday of a Summer break, and that is having friends and cousins over for an entire afternoon of sprinkler running, inflatable pool swimming, bubble blowing and ice cream licking! It was glorious, in a sticky, sun burn-y, bug biting kind of way...just glorious! Hey! Gimme a lick of that smiley-faced ice cream popsickle - thingy!